London is a city blessed with diversity. From the architecture to people from all different cultures. From historic landmarks to modern attractions. From rural parks to a fascinating urban landscape. As well as being a city like no other, this diversity leads to loads of amazing locations for an engagement shoot. In support of London’s awesomeness, it’s just been selected as the Travel’s Choice Top Destination to Visit in 2019 by Trip Advisor. I’ve been lucky enough to explore London with loads of awesome couples (from those visiting on holiday to others who’s wedding I’ll be photographing) over the past few years. 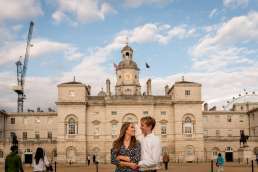 So I thought this was a good time to share some of my favourite London engagement shoot spots (all photos are taken by myself). Big Ben (the nickname given to the giant bell [weighing 13.7 tons] in the clock tower) was completed in 1859. Today it remains one of the London Skyline’s most iconic features and is a great addition for your engagement shoot. The tower is situated next to the Houses of Parliament and Houses of Lords which makes up the UK’s central government. Note that Big Ben is currently under maintenance which isn’t due to be completed until 2021. 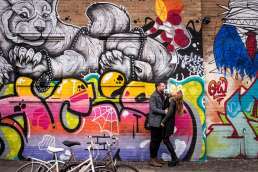 This means there will likely be scaffolding covering it during your engagement shoot. For a current view of Big Ben, check out this live webcam of Westminster Bridge. Tower Bridge is a magnificent structure to include in your engagement pictures. Tourists often confuse Tower Bridge with the much more boring looking, yet more historic London Bridge. The most famous rumour of this was when, in 1968, an American mistakenly bought the London Bridge thinking it was the Tower Bridge. When it arrived he received quite a shock. The best view of London bridge, and a little London secret, can be found via some steps that lead you down to bank of the Thames. This is only recommended at low tide. Check out Drew & Cally’s Tower Bridge engagement shoot on the blog. Greenwich Park is one of London’s royal parks, a former hunting park and famously the birth place of King Henry VIII. As well as being a beautiful park in it’s own right, Greenwich Park also offers fantastic fews over the city of London. The best spot is the One Tree Hill View point. Beware, the hill up to the viewpoint is surprisingly steep, but so worth the view. The park includes the famous National Maritime Museum and Royal Observatory. Greenwich Park is also one of my favourite locations for proposal shoots. 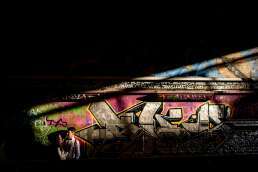 One of London’s more alternative locations, the Vaults (aka Leake Street) offers awesome examples of London street art to enjoy. 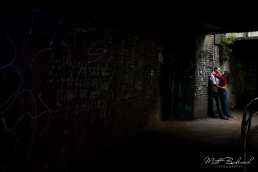 It also provides some great light to play with, especially at the south east end of the tunnel. You’ll often see street artists at work done there and because of this the walls are continuously changing. While the Vaults used to be mainly a secret among the locals, gentrification over the past couple of years has seen a number of restaurants and bars have opened in the tunnels. Check out Lorna & Brendan’s Vaults engagement shoot on the blog. Battersea Park, situated across the river Thames from Chelsea, was opened in 1858. Originally the area was known as Battersea fields and was a popular spot for duelling. Now a days it’s a popular spot for joggers, dog walkers and cyclists. Visually Battersea Park offers a lot to play with for an engagement photography session. From the trees and flower gardens to the Buddhist Peace Pagoda and surrounding bridges. Just up from Westminster Bridge, you have the London Eye. Built in 2000 to celebrate the millennium the London Eye was initially only intended to be a temporary Landmark. 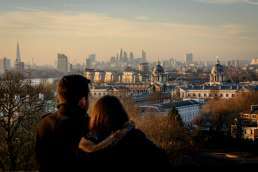 However, after it proved constantly popular (with 3.75 million visitors annually), it’s now become a permanent feature of London’s skyline. 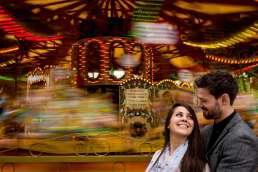 With a height of 135 metre the best location to enjoy the London eye in your engagement photos from the far corner of the Jubilee Gardens. Built in 1750 Westminster Bridge was the second bridge to span the rive Thames. Fun fact: the bridge was painted green to match the colour of the seats in the House of Commons. The bridge offers a great opportunity to capture photos of London’s icon Red Double decker buses with Parliament and Big Ben in the background. Although buses cross the bridge regularly, the may learn where the saying “like London buses” comes from. Sadly fitted with new barriers for security, it still provides a great location for London engagement shoots. You’ll also see quite a few Black Cabs. Originally built in 1692 as a hospital to serve the Navy, in 1873 the buildings were repurposed to became the Royal Naval College. 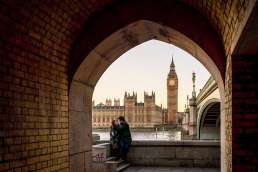 The architecture is stunning and would make a lovely historic addition to your London engagement shoot. 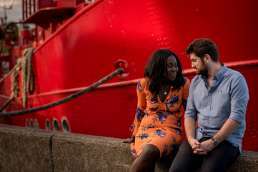 It also enjoys close proximity to Greenwich Park and the Cutty Sark (both of which are are included in this list of top London engagement shoot locations). Another one of London’s Royal Parks Regents Park is situated in the north west of the city. Wandering through the park you can enjoy some really cool gardens, people playing a range of sports and the London Zoo. If you have a dog and would like to involve them in your engagement photos then a park shoot would be a great option. Check out Hattie & Simon’s Regent’s Park engagement photo session on the blog. Further up the river there’s loads to play with on London’s dynamic Southbank, an area in the heart of London’s cultural scene. From buskers and performers lining the footpath along the river’s edge to markets and a skatepark. It’s one of those areas that seems to have a life of its own. No matter how many times I’ve been I’m still noticing something new or different each time. If you’re around in the lead up to Christmas, you can sample mulled wine while enjoying the Christmas market and wooden Chalets. From the Southbank you can also enjoy some of the best views of the icon London landmarks on the opposite bank of the Thames. These include Parliament, Big Ben, Somerset House and St Paul’s Cathedral. Potentially the most picturesque bridge in London, the Albert Bridge was opened in 1873. Fun fact: the Albert Bridge isn’t the sturdiest of bridges, leading to a sign to be placed on one end (still there today) which read “All troops must break step when marching over this bridge.” The fear was that the high risk of vibrations could lead to permeant damage. This led to the bridge’s nickname – ’The Trembling Lady’. 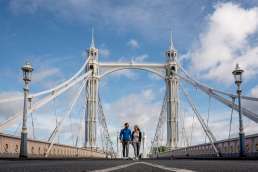 The architecturally beauty of Albert Bridge combined with its close proximity to Battersea park makes it a great option for a London engagement shoot. The Tower of London was built by William the Conqueror in 1078 as a royal palace and defence system. Today the Tower is a major tourist attraction and home to the Crown Jewels. Fun fact: to this day several ravens are still kept in the Tower because of the superstition that if the ravens leave the Kingdom will fall. Although you have to pay to enter and there’s often queues, you can still get some cool photos from the outside next to the Thames and Tower Hill Station. 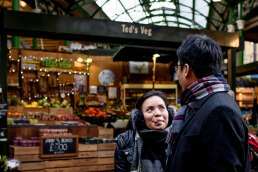 London is blessed with culinary dishes from around the globe and one of the best place to enjoy this international mouth-watering experience is at street food markets. Secret London recently created a full list of London’s Best Street Food Markets if you’re looking for one near you. My favourite Street Food Market has to be Borough Market, located at the south end of London Bridge. 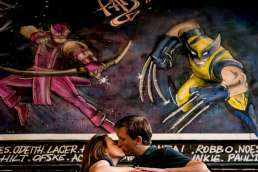 As well as being a paradise for foodies, street food markets are a great option for couples looking for more candid photos on their engagement shoot. For example they can explore the delights of the market while their photographer captures their food adventure in a more documentary style. Check out Stuart & Daniel’s Borough Market shoot on the blog. Leicester Square is a large pedestrian square in the heart of London’s West End. If you’ve ever watched a London movie premier on TV, most the time that’s Leicester Square. While it’s a little quiet in the morning it picks up the tourists in the afternoon and really comes to life at night with a buzz of activity. 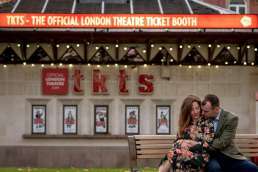 Full of bright lights and flashing signs, Leicester Square is a great modern option for your engagement photos, especially if you’re planning your shoot around sunset. Somerset House has evolved massively over its life time. Starting as a glamorous home for the Duke of Somerset in 1547, it has been the home of exiled Queens, offices for Parliament and art galleries. Today it is used for a wide range of activities for the public, including photo/art exhibitions, an ice rink in the winter and outdoor cinema in the summer. You can see a full range of what’s currently on here. 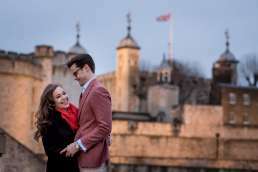 If you’re looking for a touch of touch of historic London glam for your engagement shoot, look no further than Somerset House. I’ve also witnessed a couple of proposals here. Out towards Stratford the Olympic Park (home of the 2012 London Olympics) offers some cool/interesting architecture to play with as well as being a fun place to hang out. From the Aquatics centre and main stadium to the Orbit (turned into a slide) the buildings in the park offer some great shapes and colours to play with. 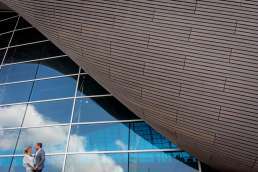 The Olympic Park is also a place where a lot of people from all walks of London life come to chill out, adding a lovely community feel to the place. 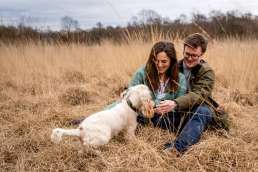 Planning an Engagement Shoot and think I’d be the perfect fit to photograph it? I’d love to hear from you! 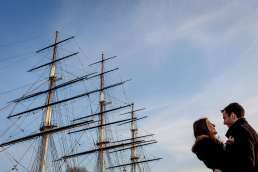 The Cutty Sark is the last surviving extreme clipper on the planet. It was built in 1869 and has journeyed the equivalent of 2.5 voyages to the moon and back. It’s purpose was to trade tea with China and at its time was one of the fastest ships on the seas. The outline of the Cutty Sark against the sky makes a fascinating backdrop with a bit of historic. 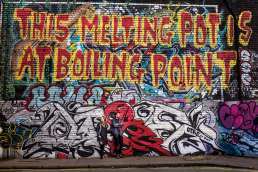 If you’re a fan of street art Shoreditch is the place to go. Shoreditch is one of London’s most up and coming areas for culture, innovation, fashion, food (personally my favourite bit) and Art. It holds a distant urban vibe and is the canvas for some of the worlds top street artists. Fun fact: the name ’Shoreditch’ comes from the old English word ’Soersditch’, meaning Sewer’s Ditch. Safe to say it’s come a long way (reflected by it’s property prices which have grown by 46% in the past 3 years). One of the smaller London parks, St James Park also offers the most. At the east end you can enter through Parliament Square or Horse Guards Parade. Within the park you have a lake, bridges, flower gardens and open spaces to relax. Running through the centre of the park you have the Mall, finishing with Buckingham Palace. This offers a fantastic range of locations for your engagement shoot within a small area. Horse Guards Parade, situated between Whitehall and St James Park, used the home of jousting tournaments help in the time of Kind Henry VIII. Later it was used as the headquarters of the British Army. Today Horse Guards Parade makes a beautiful historic backdrop for an engagement session, showing off some of Britain’s finest architecture. Built in 1300 St Pauls Cathedral is one of London’s oldest and most iconic landmarks. Between 1710 and 1962 it stood as London’s tallest building at 111 metres high. In World War II during the London Blitz brave firemen would sit on the dome dousing it with water as the bombs feel all around. One of the best spots to view the Cathedral is from the Millennium Bridge, a steel-suspension footbridge spanning the river Thames. Opened in 2000 to mark the start of the millennium it was the first new bridge to be built over the Thames in more than 100 years. 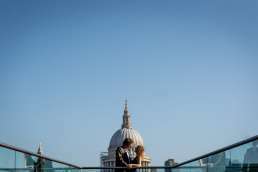 The St Pauls & Millennium Bridge combo is a great way to mix modern London with the old on your engagement photography shoot. Yes, surprisingly London does have a number of farms you can visit. These include Vauxhall, Hackney Spitafields, Deen and Kentish Town City Farms. 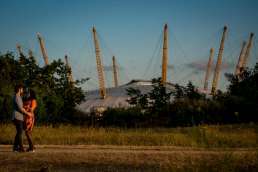 My favourite London farm and one of the largest is Mudchute Farm located on the Isle of Dogs. Tenants include cows, goats, pigs, donkeys, ducks, turkeys, aviary birds and my personal favourite – alpacas and llamas. Let’s be honest, who wouldn’t want Llamas in their engagement pictures? Check out Beth & Richard’s Mudchute Farm engagement photography on the blog. A busy cross roads in the centre of London sometimes compared to New York’s Time Square (admittedly on a smaller scale), Piccadilly Circus see’s up to half a million visitors each day. Fun fact: the word ‘Circus’ refers to when Piccadilly Circus was a full roundabout or circle. Sadly this has led to a few disappointed tourists who were expecting circus acts. 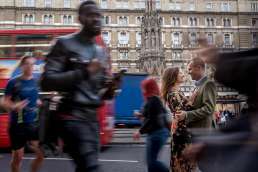 For an engagement shoot it offers a lot to play with from the big ad boards, underground signs, Red Buses passing through and the Shaftesbury Memorial Fountain. As it can be extremely busy, if you do want to include Piccadilly Circus in your photos, I’d recommend a morning shoot. Situated in London’s docklands and across the river from the famous O2 area you have Trinity Buoy Wharf. 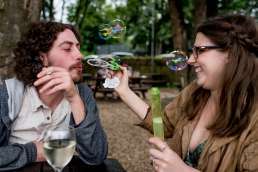 If you’re looking for something a bit alternative for your engagement photo session this might be a fun option for you. From Brightly coloured containers, London’s only lighthouse, warehouses and views of the Thames and O2 area, Trinity Buoy Wharf offers a lot of fun to play with. 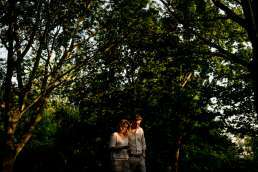 It’s also a fantastic wedding venue, especially for couples looking for something a little alternative. The new home of London’s financial district, Canary Wharf shows a very different side of London. Full of huge skyscrapers that appear to be rising out of the river Thames, it creates quite a striking image. It’s also home to the Crossrail Place Roof Garden (photo below) which provides a nice mix of nature and modern architecture. 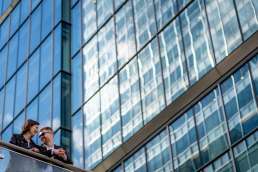 If you enjoy reflections, cool shapes and modern architecture then Canary Wharf is the ideal location for your engagement shoot. The scale, geometric shapes and surfaces (many reflective) offer a lot for a photographer to play with. Check out: Beth & Richard’s Canary Wharf Engagement shoot on the blog. Famous for the Hugh Grant and Julia Roberts rom com of the 90s, Notting Hill is a trendy and vibrant area of London. You can enjoy the Portobello Market famed for its vintage fashion and antiques. For engagement shoot Notting Hill’s streets with brightly coloured doors offers a nice alternative to London’s busier areas. Situated towards the north west of the city, Primrose Hill has some of the best views over London. Packed full of joggers, dog walkers and picnic goers, it’s a lovely spot to watch the sun go down. It’s also just a stone throw away from Regents Park and the Camden Cannel. Fun fact: Primrose Hill used to be a game reserve for King Henry VIII. Primrose Hill is also a popular spot for proposals. If you are planning to pop the question at the top of the hill, it’s a lot quieter in the morning before the tourist groups descend. From the iconic to the more alternative/ urban side of London we have the Camden Canal. My favourite part of the Canal starts at Camden Lock and winds all the way to Primrose Hill Park and Regents Park Zoo. 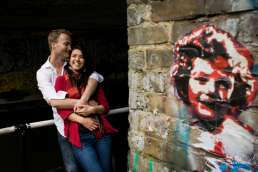 While probably not the first place to come to mind for your engagement shoot, Camden Canal offers some cool graffiti and beautiful light from the bridges above to play with. Check out Naomi & John’s Camden Canal Engagement photo on the blog. First opened in 1863 the London Underground was the first underground railway in the world. Today it remains to be the key arteries to the city of London and usually the quickest method of getting around the city. A method for hopping between locations during your engagement shoot, the London Underground also offers some gifts to play with. Using a slow shutter speed you can create some awesome photos with the passing trains. Not technically a location but for those visiting, the classic Red Phone Boxes are an iconic symbol of London. Sadly there’s not that many left and even fewer that are in good shape. The best place for a photo opportunity with a Red Phone Box is in Westminster Square (first photo below). There’s also a couple on the corner of Primrose Hill (second photo). Ah yes, the good old London pub. Although I’ve witnessed many attempts at recreating British pubs overseas they never seem to get it right. 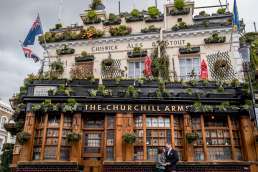 There’s something both homely and sociable about a London pub that makes it a very comfortable place to hang out. 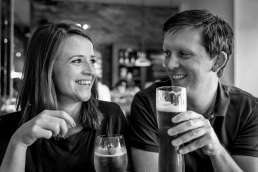 It is for this reason I’ve often started engagement shoots in a pub for couples feeling a little extra nervous of being in front of the camera. These times also provide a great opportunity for some more candid photos of the couple just enjoying each others company. 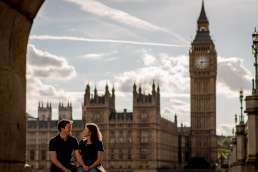 I hope you’ve enjoyed my list of 30 of London’s best spots for engagement photography! 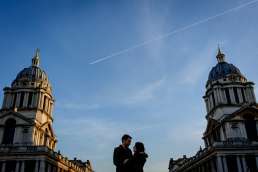 If you’ve found this list helpful or would like to share your favourite spot in London for an engagement shoot, please pop it in the comments below. Great blog post! I love the photographic tour that you have provided. Really great pics combining people with place. Portobello Road and Primrose hill (the high street and the park) are some of my favourite locations too. Thanks a lot Rowan! Glad you found it helpful!! Great post, Matt! Some excellent locations in here! Thanks a lot Michael! London has so many cool places to offer.